Pop quiz, hotshot: What are the five finest moments from the illustrious career of Keanu Reeves? Trick question. With films like Point Break, Speed, and, of course, John Wick, choosing five moments is near impossible. Look, a case can be made for other actors: Tom Cruise runs through action movie after action movie, hellbent on not aging. The heroes of Marvel comic-book movies all bring 10 tons of charm, though outside their carefully curated franchises, they leave something to be desired. But Keanu is vulnerable, sincere, physical, and supremely watchable, even in his lesser roles. Yes, even Johnny Mnemonic. This week, John Wick: Chapter 2 hits theaters and Keanu returns as a ray of sunshine in these dark times. There's no better time to remind you that he's the best thing the action-movie genre has to offer. Here's why. This whole list could be moments from John Wick and it would be impossible to argue with. 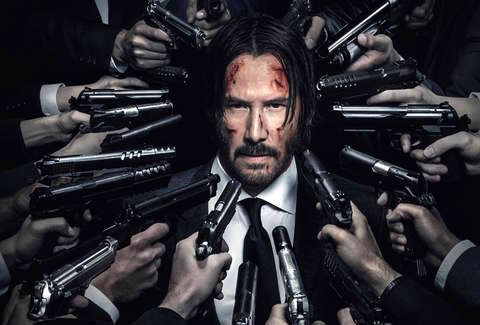 But peak Wick is the six-minute scene in which Keanu's hardened assassin slices and shoots his way through a garishly lit nightclub in order to dish out some good old-fashioned vengeance against the son of a Russian mob boss. They killed his dog. They deserve it. Keanu's action work isn't undergirded by the brute force that the Fast and Furious movies and many other American franchises hew toward. The actor relies on grace. As videos of Keanu training for John Wick and its sequel demonstrate, making demanding stunts look easy takes work. These same physical choices, more so than vocal modulations and scenery-chewing ostentatiousness that many regard as "good acting," are just as vital to Keanu in non-action scenes. In John Wick's subtle moments, a simple glance or half-hearted smirk says more than any lengthy monologue. When interacting with heavies like Willem Dafoe, Ian McShane, and John Leguizamo, Keanu relies not on heavy expository dialogue but the sudden warmth that flutters across his face and ease that betrays a deep history with these people, adding to the mythological world-building that exists in the script. Keanu missed his calling as a silent-film star. Point Break, arguably The Hurt Locker director Kathryn Bigelow's most unapologetically fun work, is a rip-roaring action flick propelled through a tender romance, at once supremely silly and surprisingly heartfelt. Through sheer skill Point Break makes the jumble of ideas cohesive. The thrilling chase sequence between Keanu's young FBI agent and Patrick Swayze's career criminal is one of the best examples of what Bigelow pulls off, partially thanks to an honest and ridiculous ending in which our star fires his gun several times in the air. A lot of this works thanks to Keanu's virility and vigor. Also, did I mention Swayze is wearing a Ronald Reagan mask the whole time? Patrick Swayze's willingness to wear a Ronald Reagan mask. Constantine is not a good adaptation of the Hellblazer comics that the film is nominally based on. It is a damn fine action movie. I was tempted to include the scene between Keanu and a cat acting as a portal to hell (because any time he interacts with animals tugs at my heartstrings), but watching his smart-mouthed, occult-practicing detective John Constantine face off against Tilda Swinton's androgynous angel Gabriel edged out the competition. Because the actor, even while leading a movie, is a great scene partner. Keanu's vulnerable and understated instincts know when to pull back and let an actor like Tilda Swinton or Rachel Weisz carry the scene. You don't find that in Hollywood. It's hard to think of an action star of his caliber whose characters aren't underscored with toxic masculinity, to one degree or another. A lot of action leads tend to be hotshots that treat friends or romantic partners as disposable until the plot transforms them into nice guys. Even with all the violence Keanu does not require the bad-boy machismo of, say, Chris Pratt's characters in Jurassic World and Guardians of the Galaxy. I'll take it a step further: In Keanu Reeves action movies, romantic relationships are either nonexistent, underplayed, or they end on somewhat opaque terms. In movies like Point Break and The Matrix, women are comrades who train him and act as windows into new worlds. Keanu has accumulated a rep for being a blank slate. What people don't realize is how much emotion -- from joy to loneliness and back again -- can be beamed out from the actor's resting face. One thing I love about Keanu is his tendency to play men who don't know what the hell they're doing or where they belong until they're introduced to a brand-new world. His characters are often profoundly lonely men looking for their place world and when they find it they aren't afraid to express joy. In The Matrix, the actor nails the mix of awe, fear, and joy that we, the viewers, are experiencing as we watch Neo learn all these badass new skills. That "blank slate" is his way of connecting with most of us who spend our days with blank looks on our faces. Keanu's sincere love of his go-to genre gives integrity to outlandish movies like Speed or the dopey Johnny Mnemonic. It's no surprise that his only work as a director was with the 2013 martial arts film Man of Tai Chi. Not only are the movie's action sequences sculpted by Keanu, it's also the rare instance where he plays the antagonist instead of the hero. The latter role is taken up by Tiger Chen, a martial artist/stuntman who worked on The Matrix films. With the help of legendary fight choreographer Yuen Woo-ping (Kill Bill, The Grandmaster, Crouching Tiger, Hidden Dragon) the narratively simple film is brimming with great fight sequences. There isn't any overly complicated editing cutting from the action. Instead, Keanu, as much as he's done as an actor, gets out of the way, letting the film be a showcase for Tiger Chen and the genre itself. Man of Tai Chi isn't groundbreaking, opting for reverence toward the genre and martial arts styling that have become synonymous with Keanu’s career. In many ways Man of Tai Chi distills what makes Keanu an amazing action star and director: his respect and knowledge of the craft. The film puts on display what has made Keanu a wondrous presence in action films since the 1990s: grace, impeccable ability to tell stories through balletic stunt work, unabashed joyfulness, and an ambition for spectacle. His films move, in every sense of the word. Angelica Jade Bastién is a freelance critic and essayist based in Chicago. She's written for Vulture, The New York Times, The Atlantic, Bright Wall/Dark Room, and RogerEbert.com. You can find her on Twitter @angelicabastien.